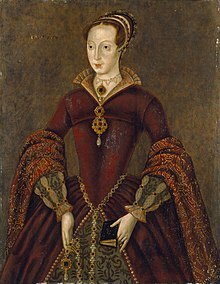 Bhí an Bhantiarna Jane Grey (1536/7 — 12 Feabhra 1554) ina banríon ar Shasana ar feadh naoi lá in Iúil 1553, le linn géarchéim chomharbachta. Tugadh 'Banríon na Naoi Lá' uirthi mar gheall air seo. Ba ghar-neacht le hAnraí VIII í agus chinn a athair agus Protastúnaigh thábhachtacha eile ar iarracht a dhéanamh í a chur i gcoróin tar éis don rí Protastúnach Éadbhard VI bás a fháil. Rinneadh é seo d'fhonn bac a chur ar an gCaitliceach, Máire Túdar, deirfiúr Éadbhaird agus an iníon ba shine le hAnraí VIII, teacht i gcoróin. Ach theip ar an gceannairc seo, ceal tacaíochta ón bpobal i gcoitinne. Cuireadh í chun báis tar éis do Mháire teacht i réim. Tugadh an leathanach seo cothrom le dáta an 4 Nollaig 2015 ag 16:40.